I was thinking about the migration of personal technology away from computers and towards mobile “appliances,” which got me to thinking about the eruption of the applications that have quickly followed in the wake of the mobile jetski; Twitter, Loopt, Kyte, Shazam, Starwalk, Red Laser..etc. I had already been thinking a lot about the “world as gameboard” – about the city as a locus of mass diversity and social transformation and the whole sense of how we are maintaining and tracking personal connections based largely on quick blips – fragments of information. As an event producer, I recognized this notion of “ambient awareness,” as exactly what people do at a party – how they energetically interact with each other and with the crowd – oftentimes even without speaking – which at certain decibel levels is a challenge in itself. 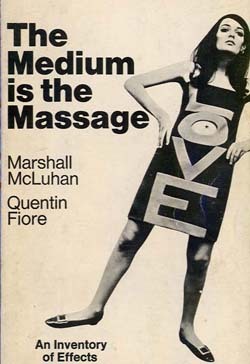 I did a search on McLuhan and came across a bunch of videos. There were a lot more of them than I realized. (Here’s a link to a bunch of them) In one particular one, he said this..
That hit me like a flat panel display. The guy was so incredibly prescient! He knew THEN what we are just coming ‘round to experiencing NOW – and he knew it 50 years ago! The “global village” – even in his lifetime, he called it the “global theater.” He knew that we were being re-tribalized to shed our isolation and to wrap ourselves in this electronic skin, so that we might be able to play a multitude of “roles” and play them in relationship to an almost unlimited number of other actors. Another of his quotes, referring to the artist – “..he is always thought of being way ahead of his time because he lives in the present.” That’s him to a T – nailed in the now, blowing his jazz – just like Louis and Dizzy and Bird. In the search results was a video by another Joyce scholar and another of my all-time favorite jazz-heads – Terence McKenna, who said this.. 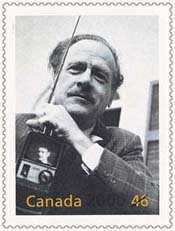 Everywhere we go now, McLuhan’s vision as well as his redemption precedes us. Like an electronic Nostradamus, he knew where technology was leading us, and he knew it was going to be a wild ride.